Tha Seasoned Traveler is at it again. This time with plans to visit the Island Nation of Dominica. You know that classic 80′s adventure tale, “Romancing The Stone“? Well, one could say that we’re living the new millennium remixed version! My name is Damon Jones but many know me as “Tha Seasoned Traveler” and my partner in travel time, Tanisha Elliott, goes by the moniker “The Pura Vida Teacher”. 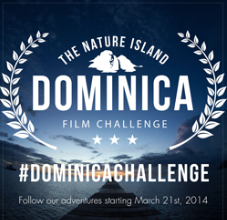 As part of of a contest hosted by www.dominicachallenge.com, we have entered our submission to join a team of Photographers, Filmmakers and Story tellers to visit The Nature Isle – Dominica. Dominica is an island in the Caribbean that prides itself in its natural beauty, history and people. Myself and the Pura Vida Teacher can be part of a lucky team to make the tour to help tell the story of Dominica. See our video submission below. Awesome video, guys! Good luck! I almost entered this myself–sounds like a great opportunity. Wow this is absolutely amazing! I would love to go on this kind of adventure. Did I say WOW!! Wishing you the best. Nomadness Travel Tribe – Nomadness American RV Takeover!